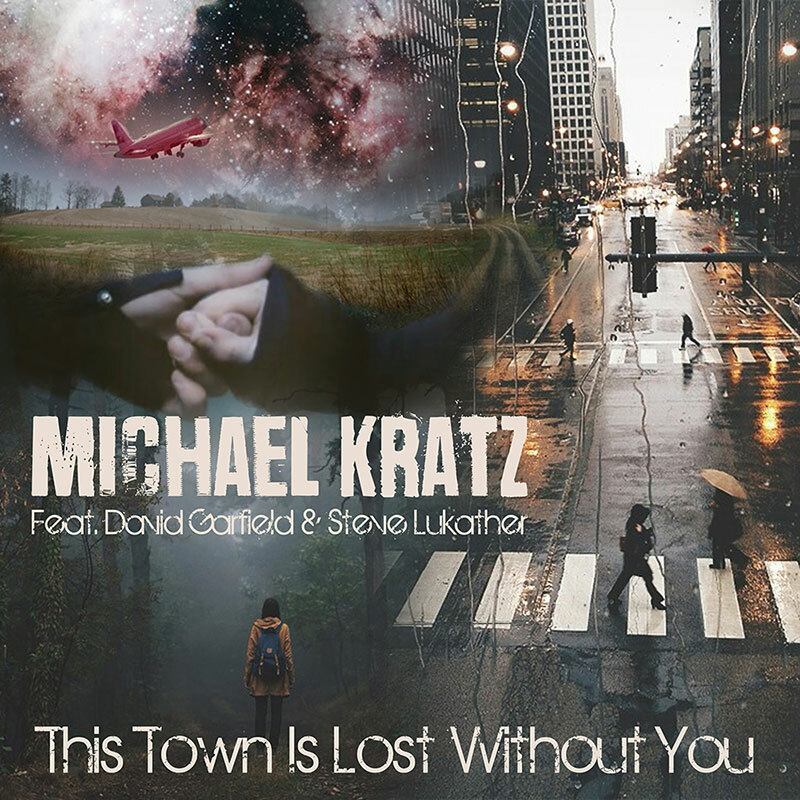 February 3rd, 2015 Michael Kratz will release the first single (This Town Is Lost Without You) of his new album featuring Steve Lukather. I came in contact with Michael and started an interview about his early career, the start and process of his upcoming album. As mentioned on his website: Michael is very influenced by the American LA based WestCoast music. David Garfield and Mike Landau are a very important part of exactly that. Can you tell me more about yourself, about the music you grew up with? What is your connection to the West Coast music? I started playing drums when I was 8. I quickly got into the Danish music scene and played drums fulltime by the time I turned 16. From the very start I was influenced by the American West Coast music and British new wave / new romantics like Duran Duran. Two different styles of music. I think, at the time, I was fascinated by the great tunes of the American West Coast music and the glamour that was a very big part of Duran’s thing in the 80’s. I played drums live and recorded a lot of albums with several Danish acts from the early 90’s up until 2011. From 2004 to 2012 I played 3500 shows with those same acts , in Scandinavia and Germany. It wasn’t my kind of music, but I had a lot of fun during that period. In 2012 Sony offered me a deal which lead me to leave the band and start working on my own project and create the kind of music that I have always loved so much. Unfortunately Sony didn’t push the album, so I left Sony a year later. I see you began as drummer, but I saw you playing guitar on your website. What’s the deal with that? I have always played guitar besides the drums. First of all I’m a drummer, but I started writing songs in 1985 when I was 13. I pretty fast realized that I had to learn to play guitar. It’s not that easy to write songs using drums as your writing equipment:-). Can you tell me more about your new album? The songs, who wrote them? I normally write all the songs and hand them to my producer team, Kasper Viinberg and Ole Viinberg, who do the arrangements and recordings. However on this album I’ve had a few co-writers on a couple of songs. My guitar player, Christian Warburg, also wrote a track for the upcoming album. Where was the album recorded? In what studio? Most parts of the tracks were recorded in Denmark at Komo Studio and Kawer Studio. The parts Garfield produce are recorded in various studios in LA. Steve quit doing sessions a while ago, but occasionally he is available. How did you get him so far to do a session on your record? When I met Garfield in november 2014 in Copenhagen, we talked about who should do the parts and I asked him about Luke. A week later I got the message I was waiting for Luke was willing to play on the track. That was a great day! How did you get in contact with these “cats”? Mike Landau, David Garfield, Steve Lukather and later Simon Phillips. That is a very impressive list. I got to know Garfield a few years back. I was introduced to him by a common friend. I asked him if he would join me on my new album and he said “Yeah sure”. He’s a really great guy! Very, very kind and a fantastic musician. Probably the coolest cat in LA. It’s an honour to work with him. Whenever we start working on a new track, I usually phone Garfield and we talk about who would be great to play the parts. I love the LA West Coast sound and I have a long list of cats I would like to work with. When we did the session with Landau, I originally asked for Luke. He wasn’t available at the time, he was touring with Ringo Starr. Garfield said:” I know Landau is in town. I can ask him”. I was like…wow! Yes! Please do that. And a couple of weeks later the session was done. There is a (recent) photo on Facebook that shows Steve and David together (again). That was during your session? For quite a lot of people it was kind of a surprise to see them together again. Yes, there are several pictures from that session. Another favorite guitar player of mine, Mike Landau. is still doing sessions (after finishing my project of collecting the Toto guys’ sessions, I will go on to collect Mike’s sessions). I saw Mike a few years ago performaing live and will see him in March with James Taylor. How was it to work with Mike? Unfortunately I haven’t met Mike Landau yet. I could not go to LA when he and Garfield did the recordings. You didn’t meet Mike during the sessions, but did you meet Steve? No, I didn’t meet Luke during the sessions. Again, I couldn’t be in LA at the time. I was busy playing in Denmark. I did meet Luke in Denmark in 2013 after a gig in Herning. 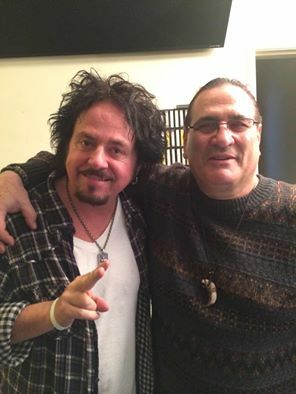 Steve Lukather is a very busy guy now that he is touring solo, with Ringo and Toto. It is great that he took the time to play on your record. Can you tell us more about the Mike and Luke sessions? Maybe stories David shared? Well, there’s a lot of great stories which I think should be kept among the gang:-). I know they had a great time and great fun during the sessions. Too bad you weren’t at the sessions in LA to see the session guys playing, will you eventually go to LA and meet David? Yes, absolutely! My management has it’s HQ in LA, so of course I will be around sometime in 2015. I did meet David in Copenhagen and we had a great time. I will visit him in LA very soon. The song in this clip, that is Mike Landau we hear? Yes, Mike Landau is playing on this track. The track will be the second or third single from the upcoming album. There is still a session to do with Simon Phillips. By then you almost got Los Lobotomys back in the studio again since almost all of the guys are playing on your album. Did that happen by accident or on purpose? There are still several sessions to do. At the moment we have only finished four tracks. I haven’t thought about getting Los Lobotomys back together on this album, but I can see your point :). It’s more like a coincident, but a great coincident! I think most drummers who like West Coast would love to do a session with Simon Phillips . I asked him to do a session on the album and he said yes. The plan is to do the session within two months. Actually Garfield and I have been talking about bringing in John Pena to do some session work. Hey, there you have it: Los Lobotomys. But still, by coincidence. There will be even more of the great LA cats on the album along with some really great Danish guys and not to forget Tony Liotta. Tony used to live in LA but moved to Germany years ago. A really great drummer! 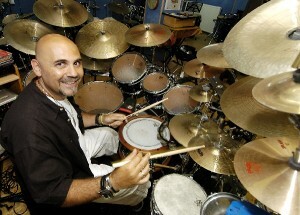 He plays most of the percussion parts on the tracks.Tony has done a lot of sessions mainly in Germany and Italy. He used to play with Gino Vanelli. Now he has his own drum institute in Dortmund. I have done some gigs with him in Germany and will do some more with him in 2015. So you asked John Peña too for a session and you asked even more LA sessionplayers? Can you tell who? Or will it be a surprise? Of course there is always Youtube to listen to your music and I saw the clip of the recordings in LA…love the sound and production. Sounds huge to me. I noticed that David Garfield is co-producer? Yeah, Garfield is co-producing most parts of the new album. Basically the parts that are recorded in LA. What kind of music can we expect on your new album? My goal is to make a Danish/American West Coast album. I believe that every song has it’s own life. It kind of dictates what to do with it. The facts that West Coast is such a big part of me and David Garfield will be a part of every track on the album, “westcoastifies” the songs and sound. Is there a tour planned after the release of your album? Yeah, my management is working on a tour. We hope to kick off early summer. I was surfing your website and I was trying to buy some music, but it was only on iTunes and Spotify. Is there another way to buy your music? The “Cross That Line” album is released in Denmark only, by Sony Music. There are plans to-rerelease it in other countries. 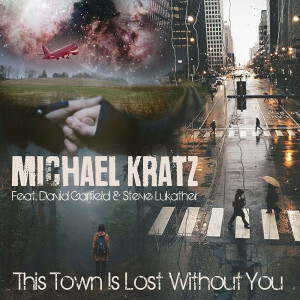 Please don’t forget to visit Michael Kratz on his Facebook Page and “Like”.